HEROES ARE BORN. THIEVES ARE TRAINED. SHE'S NO HERO. This omnibus edition includes the first THREE books in the Valley of Ten Crescents series, plus the short story prequel. Tavera doesn't fight dragons. She won't save the world. She'll likely steal your drink. How does an orphaned half-elf grow up to become a master thief and what kind of life is that for a child? Book 0: Little Girl Lost Tavera is a child passed from hand to hand as a source of cheap labor in the underworld of the Valley. When she finds herself at the mercy of the vicious sausage maker, the elderly Madame Greswin, she discovers secrets from the woman's past and the consequences leave Tavera fighting for her life. 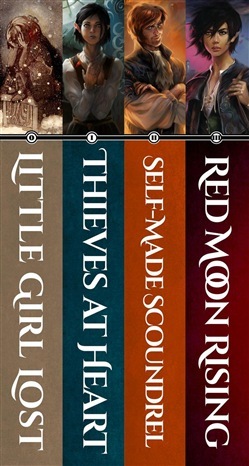 Book 1: Thieves at Heart As an orphaned half-elf in a city of humans Tavera lives in a world where she doesn't belong - until a cunning thief named Derk catches her trying to steal from him and takes her on as his apprentice. Thievery comes easy to Tavera but Derk soon becomes more than a mentor - he is the first family she's ever known - and the lessons of a father are much more difficult to learn. When Tavera discovers that Derk belongs to a secret society of elite thieves she is determined to join their ranks, but first she must prove her skills and gain their trust, and not everyone is ready to accept the young outsider. Can the group of thieves be trusted, what kind of life awaits, and what is the true cost of being one of the thieves at heart? Book 2: Self-Made Scoundrel Dershik Cartaskin's life is one of power, wealth, privilege... and lies. Son to an ambitious father, husband to a wife he cannot love, and father to a child who is not his own, Dershik has everything, and yet nothing to call his own. When the price of power and the weight of lies grow too great for him to bear, Dershik decides to leave everything he's ever known behind, and makes a deadly choice that will irrevocably alter his future. Rejecting his former life, Dershik takes on a new name and a new identity, and sets out to forge his legacy as Derk -- member of the band of thieves known as the Cup of Cream, and SELF-MADE SCOUNDREL. But soon Derk finds that even a dishonest man can't hide from the truth... Book 3: Red Moon Rising The rise of a deadly cult threatens life in the Valley of Ten Crescents. Alone, betrayed, and on the run from the law, Tavera finds herself charged with rescuing Kella, a priestess with a powerful secret who has been kidnapped by the cult. Tavera finds she can no longer be a little girl lost, but must become a leader and a savior if she is to survive the RED MOON RISING. Acquista The Valley of Ten Crescents Collection in Epub: dopo aver letto l’ebook The Valley of Ten Crescents Collection di Tristan J. Tarwater ti invitiamo a lasciarci una Recensione qui sotto: sarà utile agli utenti che non abbiano ancora letto questo libro e che vogliano avere delle opinioni altrui. L’opinione su di un libro è molto soggettiva e per questo leggere eventuali recensioni negative non ci dovrà frenare dall’acquisto, anzi dovrà spingerci ad acquistare il libro in fretta per poter dire la nostra ed eventualmente smentire quanto commentato da altri, contribuendo ad arricchire più possibile i commenti e dare sempre più spunti di confronto al pubblico online.